Eileen Ramsay, the Queen of British yachting photography during the post war years, recorded the explosion in small boat sailing during the 1950s and 60s, capturing not only the boats but sailing pioneers like Francis Chichester, Alec Rose, Col Blondie Hasler and French legend Eric Tabarly, then pressing the frontiers of solo passage making across the Atlantic and around the world. Her famous archive includes images of Olympic sailors Keith Musto and Tony Morgan, Silver medallists at the 1964 Games in Tokyo, and Rodney Pattisson and Iain MacDonald-Smith who won Gold for Britain in the same Flying Dutchman class at the Mexico Games in 1968. She also recorded the career of Charles Currey, who won Silver at the Helsinki Games in 1952, and Robin Aisher, who represented Britain in the 5.5m keelboat class at the 1960 and ’64 Games before finally winning Bronze at the Acapulco regatta in ’68. Other noted sailors to have fallen within Eileen Ramsay’s focus have been Stewart Morris, Gold Medal sailor at the 1948 Games in Torquay, fellow International 14 champion and Olympic representative Bruce Banks, and Sir John Oakeley, the son of wrestling champion Sir Atholl Oakeley, who became one of Britain’s most successful dinghy champions in the 60s and 70s, winning the Merlin Rocket Class championship three times in succession before going on to win the Flying Dutchman world championship. Eileen Ramsey was born in Sanderstead, Surrey in 1915 and raised in Amersham, Buckinghamshire where she attended Chesham Grammer School, and began her career in 1937 as a 22 year-old receptionist to the Reading based Royal photographer Marcus Adams. Adams was about to be called up to help record the impending conflict against Germany, and rather than close down his studio, gave each of his staff a camera and told them to go out and take some interesting pictures. One of Eileen’s first pictures to be published was of a scene on the Menai Straits taken in 1945 when holidaying with friends in Anglesey. The picture titled ‘Black Sails’ was selected for the 50th edition of Photograms of the Year, an annual review of the world’s best photographic art. It was during this time that she met George Spiers, then head technician at Marcus Adams studio who became her life-long partner. 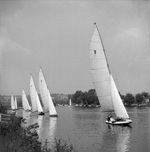 While walking along the towpath with him at Henley on Thames during a glorious summer day, she discovered what good pictorial subjects sailing boats make with the ever-changing light on sails and their reflections in the water. Once the war clouds had cleared, the two set up their own studio in Chelsea with Eileen taking any commissions that came her way from magazines and newspapers. In 1955 they bought an ex-RAF launch and moved to Hamble, the centre of sailing on the South coast, and set about to make their mark in the marine world. 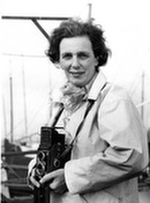 Soon, she was photographing boats in every kind of setting – sea, estuary, river and reservoir, and recorded the post-War explosion in sailing as well as the careers of designers like Uffa Fox, Ian Proctor, Jack Holt and Peter Milne, with George driving the boat, loading her Rolleiflex cameras and developing the films. “We worked well as a team, especially when covering big regattas when a hundred dinghies could shoot past our boat in a matter of minutes.” She said, recalling those years on her 100th birthday. These low level pictures became Eileen’s signature, and others began to copy her technique. “I was photographing Thames A Raters at Bourne End and cleared an area of the river bank to take my pictures as the boats sailed by. I became so involved in my work that it took quite some time before I looked up to find other photographers further down the bank trying to mimic my style.” She remembers. She photographed the first Mirror dinghy, an innovative DIY sailboat developed by TV presenter Barry Bucknell and designer Jack Holt in 1962 which, priced at £69.00 encouraged thousands of families to take up sailing for the first time. 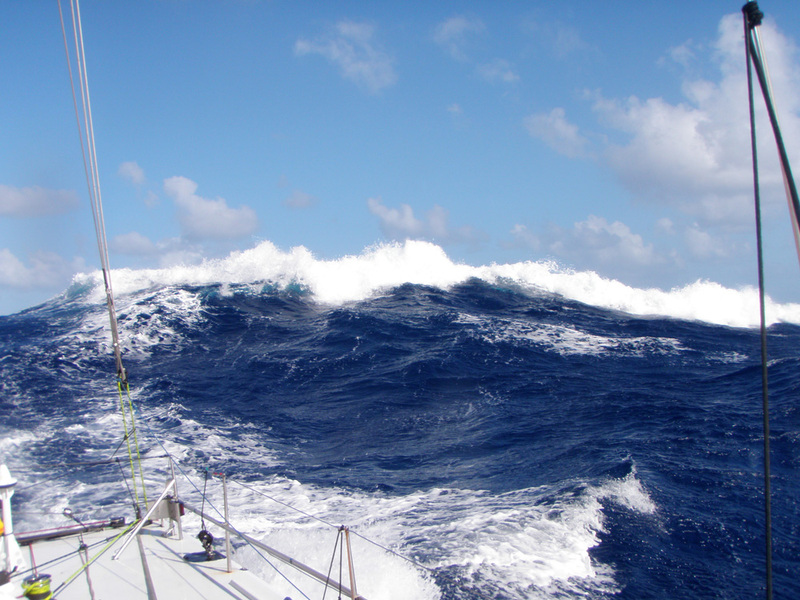 Today, there are more than 80,000 of these boats worldwide. 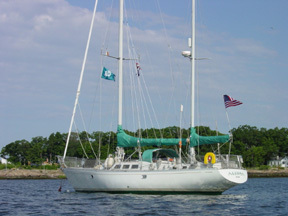 One such place was aboard the yachts campaigned by Francis Chichester, for whom she became official photographer. This famous sailing pioneer did not suffer the press well, and gave Eileen Ramsay sole rights to photograph him onboard his various Gipsy Moth boats, then forced any newspapers and magazines wanting pictures to deal with her directly. Another to have their guard up against the media was Rodney Pattisson and his Olympic crewman Iain MacDonald-Smith during their build-up to winning Gold medals at the 1968 Olympics in Mexico. They were wary of rival crews copying many of the detailed intricacies within their Flying Dutchman dinghy, but they turned out for a photo shoot with Eileen on the proviso that no pictures would be published until after the Games when her photographs were splattered across all the magazines and newspapers in the UK. Eileen described herself as an impressionist photographer, and one that ‘made’ pictures rather than take them. She hated the paparazzi approach and would photograph Prince Philip and other Royals competing during Cowes Week only when the subjects made good pictures. Eileen gave up photography in 1971 when George Spiers was killed tragically in a riding accident, but later took up painting watercolours, combining this with her love of gardening. Barry Pickthall, at PPL, says: "It was very important to save Eileen Ramsay's archive. As well as photographing dinghies and yachts for more than 3 decades, she was a specialist portrait photographer, and her early pictures of Francis Chichester, Eric Tabarly, Alec Rose and those OSTAR pioneers have great significance when recording Britain's sailing history."